The City of Plainfield will be hosting a discussion on the concept plan for a new pedestrian mall at North Avenue and Gavett Place on Thursday, May 10th, 2018 from 6PM to 8PM at Art Lofts at 152-158 East Second Street. For more information, contact the Department of Economic Development at 908-226-2513. 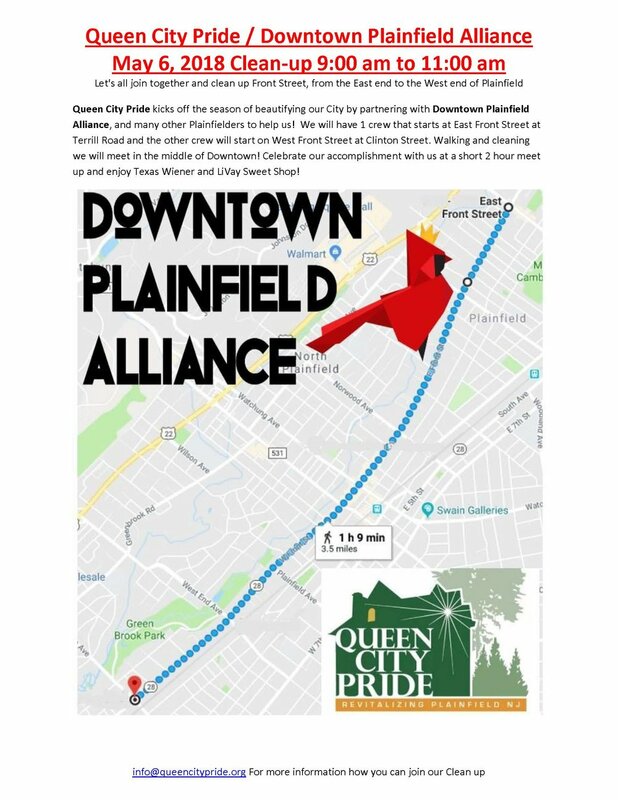 Come join Downtown Plainfield Alliance, Queen City Pride, PAAAS, St. Bartholomew School, PMUA, the Plainfield Vikings and 1st Ward Councilwoman Diane Toliver cleanup West and East Front Street at 9AM on Sunday, May 6th! We will have the supplies! Bring your sneakers! We will have two crews, one starting at West Front Street and Clinton Avenue and another starting at East Front Street and Terrill Road. We look forward to seeing everyone out improving our city! Investors Bank South Plainfield Branch and MFS Engineering & Surveyors are having a benefit concert to help rebuild Puerto Rico. All proceeds will go to the Ricky Martin Foundation. The concert will be at Woodbridge Middle School on Friday, April 6th, 2018 from 7pm-9pm. Plainfield High School sophomores volunteered to "feed the city", serving food that was donated by local restaurants at the YMCA Shelter downtown on Tuesday evening.